Do You Miss Cold Cereal? I came across this idea and recipe last night on the CrossFit BelAir website, and I was so excited that I ran to the kitchen and threw it together as fast as I could! Also, I really love having cereal-like foods for the kids because they love the variety! And because it has a high caloric density, I know it will keep them fueled all morning. This is fast, sweet, savory, nutty, crunchy and comforting. 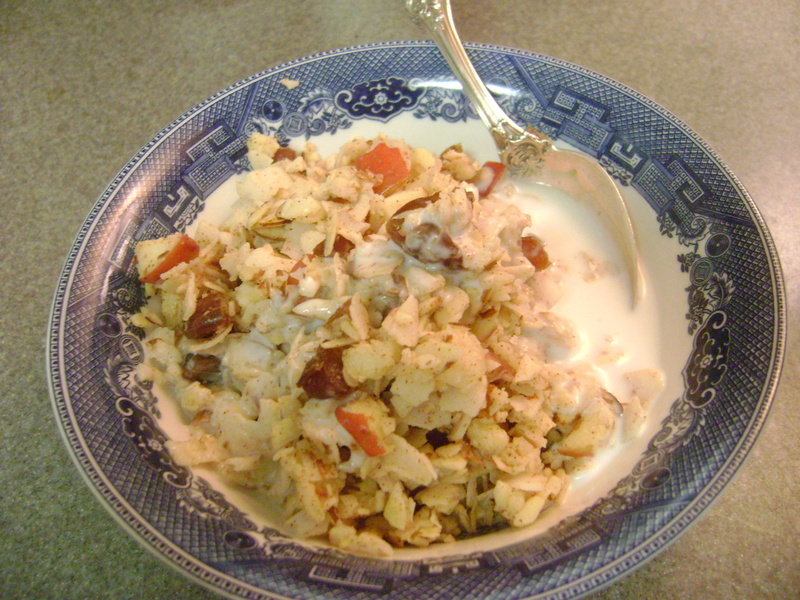 It’s like a muesli, or a granola, and it was absolutely divine smothered in creamy, coconutty, milky goodness. Here is what I did–no measuring! Thanks to Don & Mel, and CFBA! I love cereal! Can’t wait to try this! YUMMY!!!! I actually don’t like cereal, but, this looks tastey and i’m going to try it for snack… minus the “milk” 🙂 can’t wait! Eating this right now as a snack with unsweetened almond milk. Too yummy! I love the crisp crunch from the apple! Thinking this would also be a delicious topping for a grilled chicken salad or as a stand alone dessert salad with a bit of whipped coconut milk! Another winner!! The whole team loved it! AG said it’s the best cereal she’s EVER had! She’s right! Instead of using coconut or almond milk, this morning I used 3 heaping Tbsp of my favorite protein powder (hammer 100% whey vanilla) with water. For me, this is the practical way to enjoy this yummy snack and still get the protein I need for a meal! Yowser! This cereal is awesome! If there’s one thing I’ve missed more than anything since starting my paleo diet is a bowl of cereal and cold milk. Since discovering the joy and fun of making almond milk the other day, I’ve been on a quest of a paleo-compliant cereal that would taste great. This more than fit the bill! I actually made a much larger batch up and have put it in a canning jar to have it readily available to eat for breakfast each morning, although it’s pretty fast to make on its own. Thank you!